What does Your Creative Work Space look like? If you're like me, your office is in the corner of another room. You probably have piles of paper, stacks of boxes, and a little bit of clutter. But, what could it look like to really inspire you to be your best? I received a book for review. This post contains affiliate links, and I will receive compensation if you make a purchase after clicking on my links. We are all born with an innate desire to creatively express the essence of who we are. This desire is embedded into our soul, a gift at birth, our own Northern Star in a galaxy full of the unknown. Your physical setting can either hamper or inspire this creative calling. 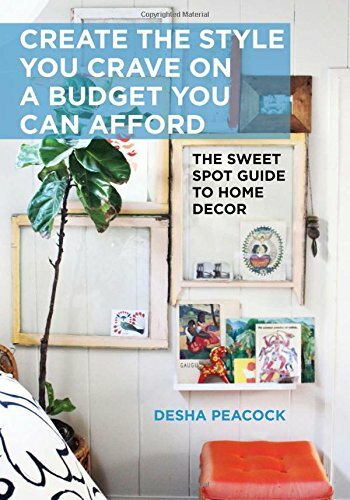 Known for her eclectic style and helping others see the possibility within themselves, their homes, and personal style, Desha Peacock offers you tips on designing a creative work space that will also inspire you to do the work you are meant to do. Use your work space to inspire your best work. Choose the right color to enhance your mood. Create a cozy virtual office no matter where you live. Work with a tiny space in a closet or other nook. Mix vintage, modern, and thrift store finds so you can create the style you crave, no matter your budget. Gain more clarity so you can focus on what’s most important to your business or creative life. Your Creative Work Space features full-color photographs of unique, creative work spaces from the traditional home office to the artist’s studio or writing salon. Your Creative Work Space introduces you to a variety of different artists and designers who have created inspiring offices and studios to work in. Each of them discusses their design style, inspiration, the challenges they had to deal with and the process they went through.There are many gorgeous full-color photographs of their work spaces. They also offer helpful advice for others attempting to create a work space of their own. Plus, the author includes their social media accounts so you can follow them for even more inspiration. 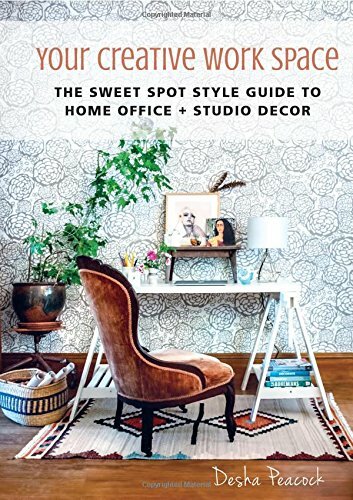 I really love how inspiring this book is.There are so many different types of office designs that there will definitely be one that you fall in love with. Some are very bold with lots of colors and designs. Others are inspired by nature. Still others are very creative and shabby chic in design. If you're hoping to create a work space that truly speaks to you, this book is where you need to start. Buy it on Amazon today. One of my readers will win a copy of this book. Books home office, wahm. permalink. My home office is the corner desk with low light and not organized bad it drives me crazy. Clutter causes me stress point blank. Yet I have not had any ideas of what I want other than near and tidy. This book sounds like it offers valuable tips I could benefit from reading. Thanks for sharing this great review. I feel like my home office has a good start. I painted it the most wonderful shade of green. It makes me think I am down in Key West. I also put up all my favorite tropical pictures. It desperately needs a floor (ripped the carpet out a few months ago) and I am struggling with shelving and how to attractively contain all my stuff. This new book sounds quite inspiring helpful for unimaginative people like me. I just redid my home office, with a nice frosted glass desk, executive office chair, cute little trinkets like a glass/sand timer, and a futon for overnight guests. I would like to get some more inspiration for the walls and maybe even some accent paint! Some fantastic ideas that I really need to do for myself. Definitely need a more relaxed and peaceful place to create. I think I’d need a larger desk, but it does look creative! My work space needs so much help. Yes, I’m the one who has stacks and piles of things on my L-shaped desk. It’s a huge desk and lots of storage for the small apartment I have. In fact, it’s in the space where I believe most folks would have their kitchen table–oh well, it works for me. I have an inversion table for my back, sitting right next to my desk. I hop on and get some back pain relief so I can sit back in my desk chair and work! Really what I need is decluttering and organization and then I can start thinking what would help motivate me to get work done. I definitely need more color but can’t paint the walls of the apartment. Yep, I need help. I wish I had a room to call my own as a workspace. Unfortunately, I have my desk, computer, etc. in the dining room. Love this! I try to make my desk at work like this. I’ve been trying to fins a space in my house to make my work space…a corner or something. I have not thought to convert the space in our small but big enough barely used coat closet. It’s brilliant! Great ideas and I need to do this. There are lots of great ideas in this book! I know the giveaway is over but I love these ideas! I am going to look into this book because my spaces need some inspiration!